Founded in 1986, the CPA firm of Duvall & Associates, Inc. has grown to a diverse company employing 28+ professionals. Emphasizing a philosophy of sterling client service, Duvall's accounting services have earned many industry accolades while garnering recognition for its unrivaled consulting expertise. In addition to traditional bookkeeping, accounting & tax services, Duvall's offers totally unique consulting expertise in business valuation, merger & acquisition, insolvency & restructuring, tax disputes, contract analysis, litigation support, financial analysis and information technology. Duvall's houses traditional CPA's, a legal graduate, 4 Certified Valuation Analysts, 3 Certified Fraud Examiners, 2 Certified Insolvency & Reorganization Advisors and 2 Certified IT professionals. 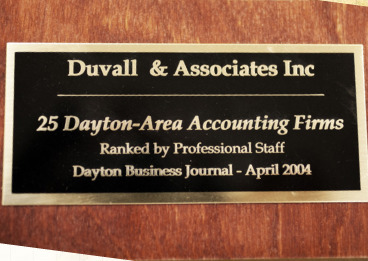 The accounting firm has been awarded such distinctions as a top-10 Dayton CPA firm, a finalist for Small Business Awards & Enterprise Spirit Awards, winner of Ohio Public Service Award, and Alan Duvall was voted by his peers as one of the top legal practitioners in Dayton.